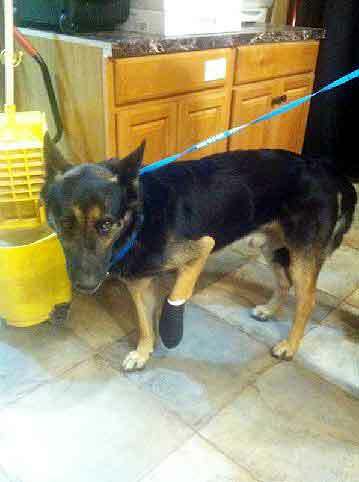 Graham was found with his leg crushed in a coyote trap; he had been there, in pain, no food or water or protection from the elements, for nearly a week! He is now in the custody of Safford Animal Control, a small, unfunded, 2-person facility unable to provide Graham with any relief..no pain control, no antibiotics, etc. All they are able to provide is shelter & food. We don't know if Graham is a candidate for re-homing yet..what we DO know, is that he is suffering...big time. Graham is very thin..the condition of his leg, foot and bones is unknown. An animal control supervisor thinks it might not be salvageable. We are currently trying to arrange for him to be brought to a local vet in the area to be evaluated and treated at our expense. We do not have a place to put him and follow up with his medical needs, nor do we know much about him, regardless..he needs HELP NOW! FOR THE MOMENT, JOB ONE IS TO GET HIM MOVED, GET ANY INFECTION TREATED, OBTAIN LEG X-ray and administer pain meds. 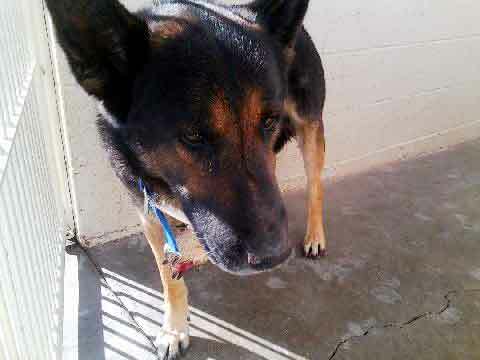 THEN, IF HE IS DEEMED NON AGGRESSIVE, TRANSPORT AND A FOSTER IN PHOENIX. Our Tucson director's son lives in the area and will be facilitating getting him to the vet on Thursday. The A.C. Supervisor says dog seems to have had a "hard life"
If you think you are in a position to help us help Graham in any way, PLEASE CALL or EMAIL US .... Thanks. Graham was transported to the vet early this morning. He was examined, had blood work done and X-rayed. He was medicated, cleaned up and bandaged. He had to be anesthetized as there was no way he would let the staff near his very swollen and somewhat necrotic leg. We went into this fully aware that this is a "country" dog from a rural ranching community and like so many others in a similar situation, probably not trained or socialized, intact and frequently able to roam and breed at will. We also knew nothing of his core temperament; German Shepherds (and most dogs) know when they are vulnerable thus void conflict when unable to defend themselves. In essence, we know that, if and when Graham feels much better, he just might not be as approachable or a viable adoption candidate. Typically we do an evaluation before moving forward but time was critical...the suffering had to be addressed. This is a crush injury...no broken bones. The extent of damage and dead tissue, loss of circulation and whether or not any regeneration will occur is unknown..it's too early to say. He will be hospitalized through Monday so that his bandages can be changed and checked daily and his pain controlled. Aside from being emaciated, his general health is good. The bill so far, is between $475.00 & $500.00. When we first learned of his plight we were told he was about 3 years old. After speaking with the Animal Control officer, she felt closer to between 5 and 7. The vet said that he could be as old as 8 or 9 years; however, she added that dogs in the area "lead very rough lives" so he very well could be a lot younger than he and his cracked teeth appear. The compassionate staff (thank you Dr. Chapman!) thinks that by Monday they will have a good idea whether or not Graham's leg can be saved. At this point, his future is in the hands of a higher power. We are so very grateful to those helping us help Graham..the need continues....THANK YOU! Our co-director's son (thanks Sean) paid Graham a visit today...we needed some idea as to his temperament. Of course, the circumstances are less than ideal and he will not show us his true colors until he is out of an "artificial environment", feeling vulnerable and off medication. That said, he was described as "a real sweetheart" and crawled right into Sean's lap. So far, aside from protecting his swollen leg, he has shown no aggression. Dr. Chapman is more optimistic today regarding keeping his leg. He is still sloughing off dead tissue and might lose some nails, if not toes, but has a good blood supply to the leg. She thinks his flexor tendon was destroyed..the jury is still out on the impact of that as we're told there's no fix for it, however, an inexpensive orthotic could be helpful. Once again, we will have to wait and see; if we are able to find housing for him in either Tucson or Phoenix, a specialist will be consulted. She also reevaluated what she believed his age might be..closer to five and maybe as old as seven years. Dr. Chapman reiterated what a tough existence he's had and that she felt he had "been on the road for a very long time". We are awaiting new photos taken this afternoon. And now for the BIG NEED; where to put him after Monday?? Since we know so little about Graham, a foster home with no other pets or very young children and who is home most of the day would be best..at least initially. We have transport available to bring him to Phoenix or Tucson but due to his follow-up medical needs, preferably a foster not too remote from town. No easy task, especially right before the holiday! Then again.. ...wouldn't it be great if we could find a CHRISTMAS MIRACLE?! Graham's future is in jeopardy. It bears repeating; he needs a GSD savvy foster with some training/handler experience. As expected, he is no Golden Retriever; while he's not considered aggressive, he is also not a real warm n fuzzy guy either. He has to be muzzled for bandage changes and he is likely not too friendly with strange dogs. No surprises here. He's nervous, feeling vulnerable, in pain and not sure of what will happen next. These are all issues we believe we can work with, however, we have to move him closer to us first. Dr. Chapman is optimistic about his prognosis given adequate healing time. What a shame it would be to lose him after an extraordinary effort to save him. 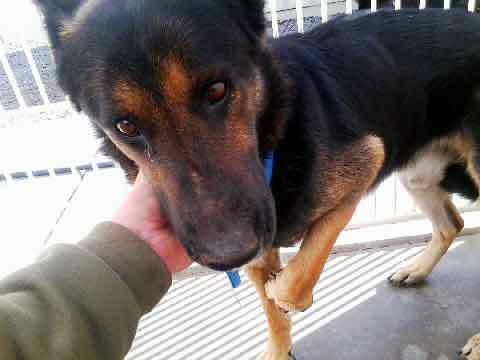 WE NEED A FOSTER FOR GRAHAM...ASAP..CAN YOU HELP?? UPDATE 12/30: We were in the process of arranging to move Graham to a training/boarding facility near us for 60 days. A very expensive undertaking but at least safe, and with the hope that he would be a better foster and adoption candidate after some training and socialization while we tend to his follow up medical needs. Unfortunately, a phone call to Dr. Chapman today to check on his health revealed that amputation of his two central toes was performed today. He is, understandably, not bearing weight on that leg yet, another milestone we are hoping for. UPDATE 1/10: We check on Graham's progress regularly yet information is difficult to obtain; this practice is the only one in the area servicing many surrounding towns thus very busy all of the time. As of yesterday Graham was at risk of losing additional toe tissue. He is bearing weight on that leg only a little bit. Info regarding behavior and temperament is scant and he's too far away from us to visit or get pictures. For now, Graham stays in the hospital as the cost mounts. UPDATE JAN 16th: We finally had the opportunity today to speak directly with Dr. Chapman. Graham has one toe left, the paw is granulating over and healing very nicely. That said, she is of the opinion that his forelimb will have to be amputated...Graham simply will not use or place that foot on the ground. With the type of injury and subsequent surgeries that Graham has had, pain is not the only issue; nerve damage might very well be at play here. Dr. Chapman believes that he will not ever use that leg as he continues to hold it up. There is also a possibility that Dr. Chapman has an out of state friend in whom she has absolute confidence, a GSD lover who might take Graham and oversee his recovery. We have asked that he be given a bit more time before a decision to amputate is made; we have left Graham's future in the Vet's hands and will keep everyone apprised of his status. We will continue to keep his safety and care priority one and are so very grateful to his fan club for helping to make this possible. Today we mailed a check off to Desert Cross Animal Hospital aka Dr. Chapman, and gave the go-ahead for Graham to move to New Jersey. A good friend of hers will be flying here in just under two weeks to pick Graham up and take him home with her. According to Dr. Chapman, who by the way, did a great deal of surgery and care pro bono, her friend is the captain of a fire district, her boyfriend a canine officer. They are GSD lovers ready to take on any challenges ahead with respect to keeping Graham happy & safe. We have asked for updates as to how he is doing but have no way to ensure that will happen. ...IT REALLY DOES TAKE A VILLAGE! Graham ultimately did have to have his leg amputated as the major nerves had been severed leaving him no control and unable to use it. He also did go to New Jersey and was adopted by a wealthy lady whose life revolves around keeping Graham happy and active. It turns out that Graham Is a mush pot lover boy, affectionate with all; a HAPPY ENDING (actually begining) indeed.